When outdoors, a cat sure gets around. In fact, a crowd-sourced mapping project that equips cats with GPS devices has the interactive maps to prove it. The trouble is, there are lots of potential hazards along an adventurous cat’s route, including moving cars, dogs and wild animals, infectious diseases, parasites and toxins. This is why leash-walking your cat can be a safer alternative. And it may cut down on the dead bird and mouse “gifts” your cat delivers to your doorstep. Taking cats outside, especially if they are typically only indoors, can provide added enrichment through mental stimulation and physical exercise. And exercise helps keep your feline from putting on extra weight. To start, you’ll want to make sure your cat is well socialized and comfortable with new people, other animals and strange noises. As with any training, it usually helps to start with young kittens, but older cats can learn too. If your cat hides under the bed when the doorbell rings, they may not be a great candidate for leash walking, but it’s worth a try. While helping your cat become accustomed to the harness and leash, lavish them with high-value treats and praise so they always associates training with positive rewards. Help your cat become comfortable one small step at a time. Gradually work up to longer training sessions. If your cat becomes agitated, that’s your cue to stop the session for the day and try again tomorrow. Collars can be dangerous for cats outdoors. If your cat is frightened by something, it may squirm out of the collar or dart quickly so the collar pulls sharply against the trachea potentially causing harm. That’s why it’s better to start with a harness. Ideally, choose a lightweight jacket harness that provides more surface area to distribute pressure than a typical strap harness. If your cat has never worn a harness before, don’t ambush them by strapping them into it all at once. Start by placing your hand through the harness in the opposite direction that your cat would normally enter it. Place a treat in your hand to lure your cat toward you. After your cat has eaten the treat, pull your hand up and gradually move the harness down your arm, closer to the hand. Add another treat until your hand is inside the harness and your cat must place their head through the harness to get the treat. Slowly pull the harness over your cat and clip it on them. Give them lots of treats and praise for as long as they tolerates the harness. 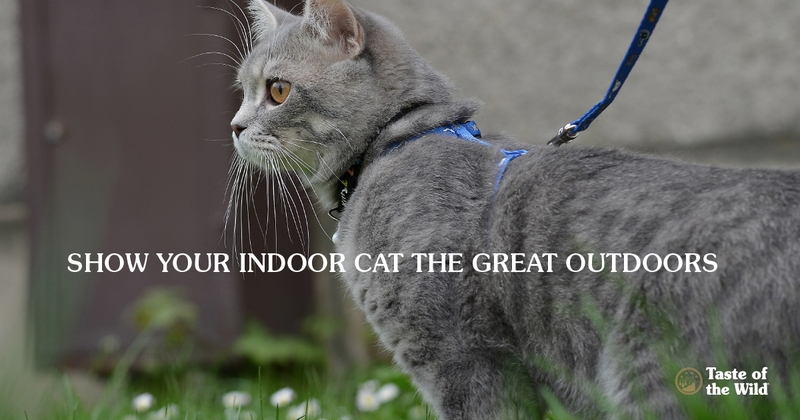 Allow your cat to walk around the house wearing the halter with the leash dragging behind them (make sure the leash doesn’t catch on anything and pull tight). Once they are comfortable with that, pick up the leash, keeping it slack, and lure them forward with treats. Like the rest of your training, you’ll want to get them used to the outdoors gradually. For your first outing, make sure it’s a quiet time of day and there aren’t any loose dogs in the vicinity. Allow your cat to explore within their own comfort level. It may take them several days to work up the courage to leave the yard. During this time, just follow them rather than expecting them to follow you. Again, give them treats and praise as they gain more confidence. Once they leave the yard, keep on the lookout for loose dogs, noisy traffic or any other distractions that may upset them, and be prepared to pick them up if need be. Eventually, you can try walking ahead of them and luring them with treats to give them the idea to follow you. If your cat never gets to that stage, that’s OK. Even a little fresh air and exercise on a regular basis can do you both some good.